We’re thrilled to share that our founder and director Christine Cunningham, Ph.D. has been recognized for her work in engineering education with a national award. On Nov. 20, 2016, she accepted the Pre-University Educator Award from the Educational Activities Board of IEEE, a professional organization for engineers and scientists and the world’s largest professional association working to advance technology for the benefit of humanity. IEEE specifies that the award is given for work that inspires PreK-12 students to appreciate and understand mathematics, science, technology, and the engineering design process and encourages them to pursue technical careers. That charge is a perfect match for the mission of the Engineering is Elementary (EiE) project: Christine launched the curriculum development process in 2003 with the express goal of increasing student understa nding of science and engineering, and promoting all students' interest in engineering careers. 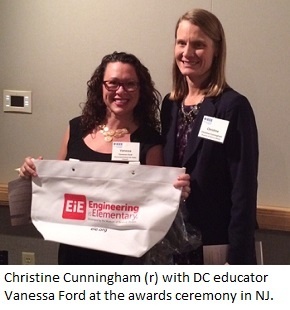 The IEEE announcement was a thrill for everyone at EiE in another way: this year, a second Pre-University Educator Award went to Vanessa Ford, the STEM teacher for Maury Elementary School in Washington, DC. Ford is a longtime friend of EiE, a Raytheon-EiE scholarship recipient and a dynamic innovator who launched the school’s “Think Tank,” a hands-on STEM lab where she teaches EiE (along with other science and engineering curricula). 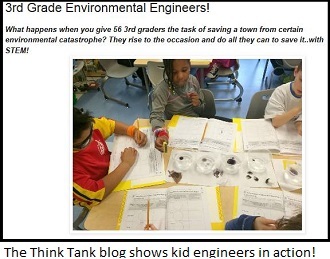 Check out what Vanessa's kids are doing on the Think Tank blog. When the EiE project launched more than a decade ago, no one was rushing to proclaim the importance of early engineering education; in fact, many educators were quite skeptical that engineering had a place in the elementary classroom. But today elementary engineering is mainstream, thanks in part to the release of the Next Generation Science Standards and (in many cases) newly modified state science standards that incorporate engineering. Awards recognizing that our work has made an impact are deeply gratifying. And now that elementary engineering education is a mainstream idea, you might think our work is done. But that's not the case. We're taking a moment to celebrate, and then it's full steam ahead (or is that full STEM ahead?) on a host of new engineering education projects—creating resources for preschool students and afterschool programs, and digital learning opportunities for educators—with our eyes on the goal of seeing all students fired up about STEM.